Tektronix, Inc., the world's leading manufacturer of oscilloscopes, recently announced a series of enhancements and extensions to its SFF 8431 SFP+ compliance and debug offering, including new support for the demanding Transmitter Waveform Distortion Penalty for Copper (TWDPc) measurement that can only be performed on oscilloscopes with very fast sample rates, such as the Tektronix DPO/DSA/MSO70000D Series. With these enhancements, Tektronix now provides the industry’s most complete automation and debug solution for Ethernet-based SFF-8431 SFP+ PHY layer testing. This solution includes a new SFP-WDP option that enables automated setup & execution of important TWDPc measurements, along with a new Host Compliance (HCB) and Module Compliance Boards (MCB) that speed test setup of connector designs used in high speed Ethernet and Fibre Channel-based systems. The latest release of SFP-TX includes a built-in de-embedding feature. As technologies such as SFP+ increase data rates, the eye is closed and certain components such as SMA cables need to be de-embedded for improved test results. With this new feature, SFP-TX enables designers to de-embed signals using .FLT files. As defined in the SFP+ Host Transmitter Output Specifications for Copper, TWDPc measurements must be performed using a real-time oscilloscope with at least a 70 GS/s sampling rate. 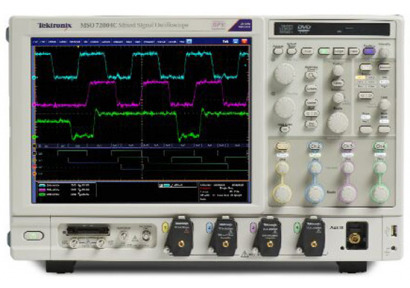 The industry’s most reliable results are achieved with use of the Tektronix DSO/DSA70000 series oscilloscopes that offer industry leading 100 GS/s sampling rate performance. Option SFP-WDP is $3,600 US MSRP and Option SFP-TX is $5,000 US MSRP. SFP-WDP, Release 2 of SFP-TX and SFP+ HCB and MCB are available now.